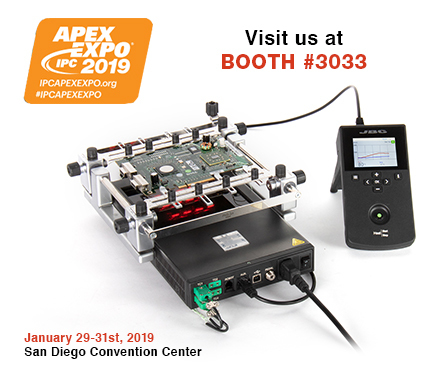 JBC, a leading manufacturer of soldering and rework equipment, is pleased to announce its participation in the IPC APEX EXPO 2019. The exhibition will take place at the San Diego Convention Center in San Diego, CA from January 29 – 31, 2019. Visitors will be able to find JBC at booth #3033. - Live demonstrations of the JBC Net software along with the Dynamic Soldering Profile functionality. - Its new Pre-heater, which connects up to 4 thermocouples to get a better control of the PCBA temperature and allows a PC remote control through a USB connection. - It will also introduce the new Thermal Wire Stripper with exchangeable tips to fit different cable sizes. “We are proud to be participating in the IPC APEX Expo. As always, it’s a great experience to meet new people and make an impact with our revolutionary technology. This year, we are proud to share the new generation of soldering solutions and robotics that will help solving the most complex challenges that our clients face on a daily basis,” said Jose Larrea, office manager at JBC Tools.